Technology: Tool and Die Repair Services are machining and rebuilding services associated with worn and damaged production tooling, etc. Often offered as an adjunct to tool and die making and design services, tool and die repair services use a number of machine shop methods to refurbish worn and damaged die sets, fixturing tools, etc. 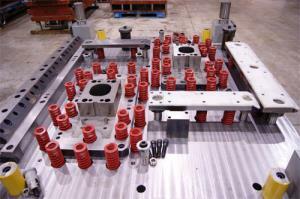 Retrofitting of existing tooling to produce different parts is another service that many firms offer. Many services provide emergency/fast turn-around to minimize downtime from out of service production tooling. Services often have the capability to perform material build up and hard facing. Die sharpening is also a routine service. Applications: Tool and die repair services promote an economical alternative to building new tooling.